However, the out of court settlement means that the Department of Defence will not be making any admissions of liability. Mr Donaldson’s settlement is separate to a number of class actions are currently being undertaken by three communities seriously impacted by per- and poly-fluoroalkyl substances (PFAS) contamination including Oakey, Williamtown in New South Wales and Katherine in the Northern Territory. Friends of the Earth hopes that the class actions will be successful. It is believed that the settlement with Mr Donaldson will most likely not impact on the class actions. The class actions also raise the spectre of potential impacts of people exposed to PFAS through a variety of uses other than pollution from groundwater. These could include class actions against the manufacturers and suppliers of non-stick cookware, Scotchguard, Teflon, fast food wrappers and a multitude of other uses. Friends of the Earth has been researching the PFAS issue for some time, and has produced a map detailing sites affected around the country. Friends of the Earth fears that the impact of the PFAS extends far wider than military bases. PFAS has been detected over hundreds of locations across Australia, even drinking water. Of major concern is the potential contamination of a wide variety of crops due to the use of recycled water and biosolids which may be contaminated with PFAS. Whilst not opposed to the use of recycled water it is important that adequate treatment is provided at waste water plants to adequately deal with PFAS and other contaminants. 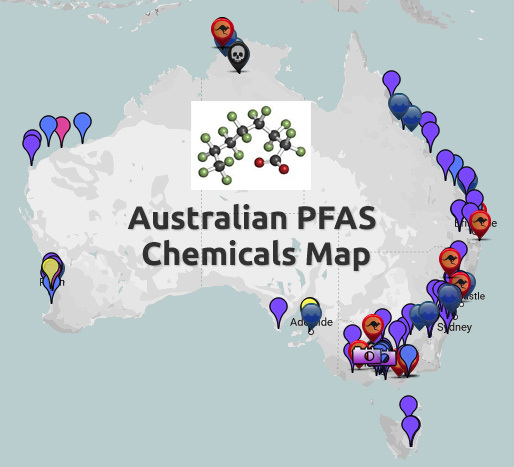 Friends of the Earth is also having major concerns over the contamination of landfill sites across Australia and the pollution from these sites with substances including PFAS. Please support our PFAS and Pesticide work with a tax deductible donation. Currently all of our work in this area is completed by volunteers.